The gastrointestinal system is responsible for the complex process of digesting food. This means that your daily food and nutrient intake is critically important to its proper function and for the prevention of GERD as well as other digestive complaints. 1. Garlic is believed to have antibacterial and antifungal properties. It can even kill Helicobacter pylori a pathogen resistant to stomach hydrochloric acid. It helps is maintaining beneficial flora of friendly organisms thereby normalizing the digestive process. Garlic may be used in food, chewed or made into juice. It is important to crush or juice the garlic in order for its active ingredient allicin to work. 2. Ginger is also a good digestive aid. May be used in foods, as tea, or chewed as candied ginger after meals. 3. Green tea also contains polyphenols which have better free radical quenching effect than vitamin E and vitamin C.
4. Broccoli has the required vitamins and minerals and also boosts the production of enzymes. 5. Multigrain breads, brown rice, oatmeal, and bran-based cereals are high in fiber. These bulk foods decrease the transit time of food in the intestinal tract as well as help eliminate toxins. 6. Herbal teas made from ginger, chamomile, catnip, cloves, etc. 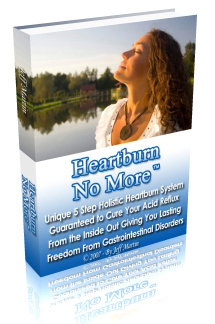 help prevent GERD symptoms. 7. Red apples and bananas are generally considered miracle cures for GERD. 8. Vegetables like carrots, cabbage, green peas, and beans are also healthy. 9. Meat should be lean like skinless chicken, fish, or only whites of eggs. This list of safe foods is neither complete nor accurate. The causes and symptoms of GERD are very complex and vary from one individual to another. A food that clears symptoms for one person may exacerbate symptoms in another. It is therefore advisable to keep a detailed journal of the foods eaten and the symptoms it triggered off. This will help eliminate foods that do not agree with you. But just eating healthy foods and avoiding others is not enough to cure GERD. Since GERD is caused by a combination of internal and external factors, a holistic approach is absolutely essential in order to cure GERD. A holistic medicine practitioner will cover all aspects of the body - the mental, emotional as well as physical to heal the body completely. Making lifestyle changes, incorporating good eating habits, stress management, and a positive attitude form the pillars of this type of treatment.